Hi! We’d love to hear from you. Deccan Herald is Karnataka’s guide to the times we live in, and is more often than not the authentic voice of the community. While Karnataka and Bengaluru hold a special place in the heart of the newspaper, the Herald’s coverage of national and world happenings is equally comprehensive. The opinion pages present a variety of views on national, state and international issues and the editorials are known for their well-informed commentary. The feature sections give readers not only various perspectives, but also the emotions behind the stories. 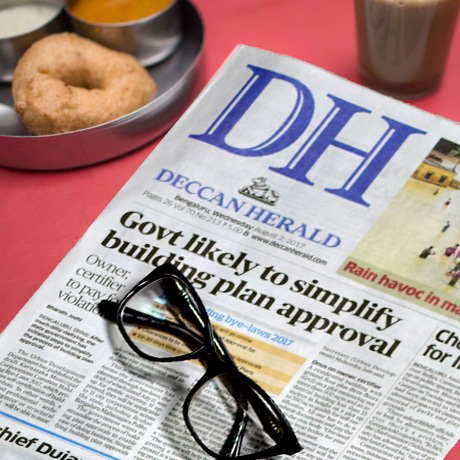 The Deccan Herald is often seen as the newspaper of record and has set the benchmark for high quality journalism in Bengaluru and Karnataka. The variety of supplements is a unique part of Deccan Herald. A potpourri of food, fashion, culture, theatre, events along-with all the local happenings around Bengaluru. A precious bounty of information on Karnataka's heritage, environment, science and technology. A medley of thought-provoking articles on art, culture, heritage, entertainment, humour, travel and literature. Prajavani is considered the most trusted and credible news brand across Karnataka, often leading coverage on big stories and carrying significant influence on public policy and current affairs. Over the years Prajavani has managed to spread its coverage and reach all regions of Karnataka, including Bengaluru, Hubballi, Mangaluru, Kalaburagi, Davanagere, Mysuru and Hosapete with local reports and multiple editions with zonal (district-level) splits. 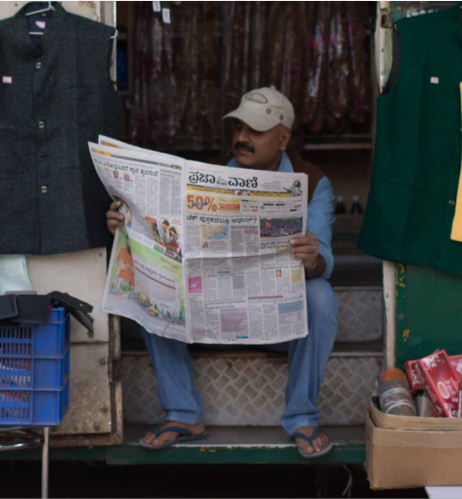 Prajavani maintains a large staff of highly qualified journalists in order to report the most thorough news and analysis from the entire State. Prajavani has become an integral part of Karnataka’s communities and has contributed to local politics, literature, and culture. Today, many eminent Kannada writers are recipients of the Prajavani Deepavali Visheshanka award, one of the most prestigious literary awards in Karnataka. A veritable collection of engaging, entertaining artciles on different topics, to keep you totally engrossed. One of the most sought-after supplements that celebrates womanhood. A kaleidoscope of Karnataka’s heritage, history, natural wonders and more. The esteemed Kannada weekly Sudha was started on 11 January 1965. Since then, over 2,700 issues have reached the doorsteps of its readers. Sudha caters to a variety of people across Karnataka. It emerged as a lifestyle magazine covering literature, culture, health & food, travel, women’s issues, cinema, beauty & fashion and contemporary issues. The magazine publishes serials and short stories written by well-known Kannada writers. The editorials focus on contemporary issues written by in-house journalists, freelancers, and well-known columnists. The magazine provides high quality articles as well as a variety of photographs - from wildlife landscapes to film stars. Sudha is the first magazine to bring a complete “Hasya” magazine which is published every April. On the auspicious occasion of Ugadi (Kannada New Year), a special issue along with the bonus issue is released. Started in 1968, Mayura is a dedicated Kannada literary monthly magazine. Through stories, columns, a unique design and issue-based writings, Mayura has emerged as a leader in its category. In addition to valuable information, Mayura also has the latest developments in music, art, and theater. The magazine not only understands the needs of its audience but also tries to present new stories, ideas and opinions to expand their imaginations. Mayura has left a unique footprint in Kannada journalism. Both a popular and serious literary magazine, Mayura publishes a variety of quality stories across genres such as detective, scientific and secular stories. Stories are translated from Telugu, Tamil, Malayalam, Hindi, Marathi, English and other languages to increase the variety offered in the magazine. Kannada’s great writers like P Lankesh, K P Poornachandra Tejaswi, Goruru Ramaswamy Iyengar, Anupama Niranjana, M K Indira, Jayanth Kaikini, Besagarahalli Ramanna, T K Ramrao, Fakir Mohammad Katpadi, Bolwar Mahammad Kunhi, Veerabhadrappa, Baraguru Ramachandrappa, Beechi, Nagathihalli Chandrashekhar, M H Nayak Baada, Na D'Souza, Gopalakrishna Pai and others have written for Mayura. We, The Printers (Mysore) Private Limited (TPML) are the publishers of Deccan Herald and Prajavani newspapers and related publications. 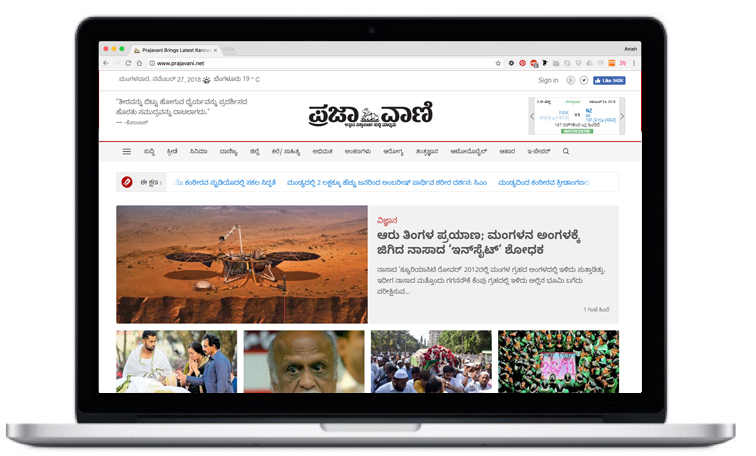 We own and manage the internet websites https://www.deccanherald.com, www.prajavani.net, https://printersmysore.com and other related websites, media, etc. as part of our publishing group. We are committed to the protection of personal privacy and have adopted a policy to protect information about individuals. Any or all information that you may provide to us shall be kept strictly confidential unless the same is required to be disclosed or acted upon during legal proceedings, as and when the need arises. Users are invited to submit comments, questions, ideas, reviews or any other information concerning TPML publications and the website's contents, provided they understand that such comments will be subject to moderation & TPML reserves the right to remove or edit such content. All such submissions should not be illegal, obscene, threatening, defamatory or infringing on privacy or on intellectual property rights of others. Personal information: Depending on your actions on our site, we collect different information of you when you register (signup) on our site, place an order or subscribe to our newsletter. While signing up with us, you may need to place your name, email address, and billing address (if intended to make a purchase). We don’t share your data with third-parties in a way as to reveal any of your personal information like email, name, etcetera (subject to laws and regulations). If you have been through the ways we collect data from, Only our administrators have access to your data. No third party can access to your data from us. However, you can review and delete your data whenever you want. The purpose of taking these data is to identify you as our customer/subscriber/patron and deliver products/notices and other marketing materials. Visitors aren’t allowed to purchase any product or subscribe to newsletter or make a comment anonymously. So, these information are the only means we can identify you and allow you to make these actions on the site thereby. When you register for an account, we process and keep your personal data we have about you for as long as you don’t delete the account/unsubscribe yourself (subject to laws and regulations). The collected data are processed in several ways. We use your personally identifiable information (name, email address, etc.) to identify you in order to contact, send newsletter, and provide products & supports. The non-personal data may be used to improve the service. If you have an account on our site, or have comments, you can request an exported file of the personal information we have about you. You can also place a request to erase your data. This does not include data we are required to keep for security, administrative or legal purposes. We may talk about third party products and services on our website. Third party sites have their own privacy policies. So, therefore, we have no responsibility or liability for the content and activities of these linked sites. You can review and update your information at any time by going to your account details. 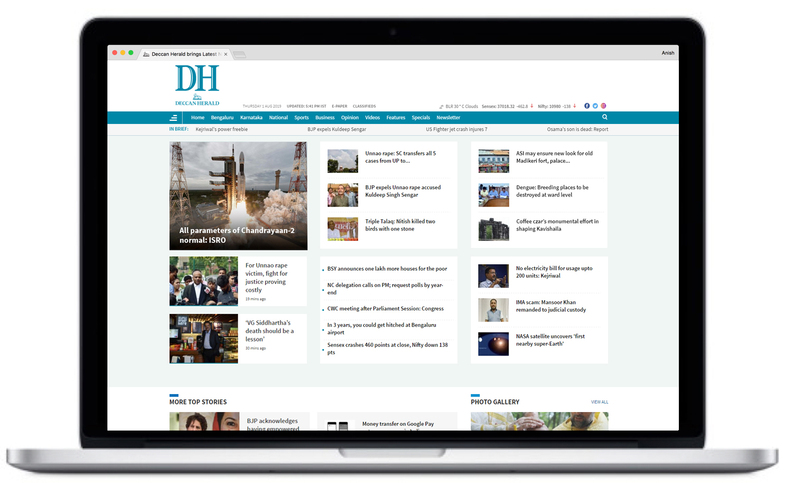 If you want to delete or get a copy of your data on our site, send a mail to DHfeedback@deccanherald.co.in. We will do that with immediate effect. This site offers a newsletter/email subscription services and cookies may be used to remember if you are already registered and whether to show certain notifications which might only be valid to subscribed/unsubscribed users. To provide you with a great experience on this site we provide the functionality to set your preferences for how this site runs when you use it. In order to remember your preferences, we need to set cookies so that this information can be called whenever you interact with a page is affected by your preferences. To provide readers like you with a great experience on this site and right recommendations, we will track your journey from story to story and we keep track of the same. The Google AdSense service we use to serve advertisements uses a DoubleClick cookie to serve more relevant ads across the web and limit the number of times that a given ad is shown to you. If you have any concerns or questions, please use contact details as found in this website. Thank you for taking the time to read our Policy and Disclaimer. TPML is not responsible or liable for any claims of losses, injury, etc. on account of reliance on advertisements on our website/s. The content and claims made in all/any advertisement/s that appears on our website is solely the responsibility and the representation made by the respective advertiser. Any action or reliance placed upon viewers or users of our website upon advertisements therein should be taken after due and proper independent verification of claims of the advertiser. TPML does not endorse the correctness or marketability or merchantability of services, goods, products, claims, etc. found in any advertise on its website/s. In no event shall TPML be liable or responsible for any claims from anyone in connection with advertisement/s on TPML website/s. Information and services published on this website are subject to change without notice. 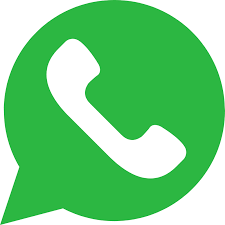 You may at your discretion provide information to us through our contact information provided in order to receive further information about us or our services enumerated on this website. If you do so, you agree that any such information becomes our property and may be used by us or others, reproduced, published, transmitted, displayed modified or distributed at our discretion, subject to our obligations under our Privacy Statement. All contents of this website, including the software, design, logos, trademarks, text, and graphics are owned by or licensed to us and are protected by copyright under the laws of India. Apart from fair dealing for the purpose of personal use, private study, research, criticism or review as permitted under copyright legislation, you may not reproduce, transmit, adapt, distribute, sell, modify or publish or otherwise use any of the material on this website without our prior written consent. WE EXCLUDE ALL WARRANTIES, CONDITIONS, AND REPRESENTATIONS WHETHER EXPRESS, IMPLIED, STATUTORY OR OTHERWISE, RELATING IN ANY WAY TO THIS WEB SITE AND ALL ITS CONTENT, YOUR USE OF THIS WEB SITE AND THE INFORMATION AND SERVICES OFFERED OR ACCESSED THROUGH THIS WEB SITE; AND LIABILITY (INCLUDING FOR NEGLIGENCE) TO YOU OR ANYONE ELSE IN RESPECT OF ANY LOSS OR DAMAGE (INCLUDING SPECIAL, INDIRECT OR CONSEQUENTIAL LOSS OR DAMAGE), COSTS AND EXPENSES SUFFERED BY YOU OR CLAIMS MADE AGAINST YOU ARISING FROM OR IN CONNECTION WITH ANY USE OF THE INFORMATION, PRODUCTS OR SERVICES SUPPLIED, OFFERED TO BE SUPPLIED OR ADVERTISED OR ACCESSED THROUGH THIS WEB SITE FOR ANY REASON WHATSOEVER (INCLUDING NEGLIGENCE). NO LIABILITY WILL FASTEN ON TPML, ITS AGENTS, EMPLOYEES, ETC. IF YOU ACT ON YOUR OWN ON ANY INFORMATION THAT IS CONTAINED ON THIS WEBSITE. WE WILL ALSO NOT BE LIABLE FOR ANY ADVICE OR INFORMATION THAT YOU MAY GATHER FROM US THROUGH THIS WEBSITE UNLESS THE SAME IS PROVIDED BY US THROUGH OUR REGULAR COURSE OF INTERACTION/COMMUNICATION ORIGINATING FROM INTERNALLY AUTHORISED SOURCES. You agree to indemnify us and our partners, agents, officers, employees and other authorized representatives against all claims, suits, demands, damages, liabilities, costs or expenses arising in any way out of or in any way connected to your use of this website. Any legal issues or disputes arising out of the use of this website will be governed by the laws of India and by using this website you submit to the jurisdiction of the courts in Bangalore City alone.